Today, I am mixing up a cocktail inspired by two other classics: The Gin Gim let, and The Cherry Lime Rickey. Both of these drinks were extremely popular from the 20's straight through to the late 50's. Gin Rickey's are ordered by Gatsby in Fitzgerald's classic, and many know the gimlet as Betty Draper's (Mad Men) poison of choice. The Cherry Lime Rickey was a popular soda fountain drink around the same time, using sweet cherry syrup for a refreshing summer pop. Cherry season is still in full swing here in Northern California, and with the hot days driving me for a refresher, I've looked to these classic summer cocktails for inspiration. The result? 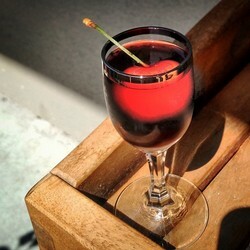 The Cherry Lime Gimlet. Shaken hard and strained, like a gimlet, this drink looks beautiful in your fanciest cocktail glass. Add all ingredients to a cocktail shaker with ice. Shake hard until shaker frosts. Strain into a cocktail glass. Garnish with lime wheel and Luxardo Maraschino Cherry. Here in Napa Valley the first fresh cherries have hit the farmer's markets; and to me, that's something worth celebrating. And Napa Valley Distillery has the perfect spirit for all your cherry based cocktails, our Cherry Brandy. This spirit is one of my favorites for mixing in cocktails, because it simultaneously functions as a whiskey and a brandy. You get the soft, fresh fruit note from the cherry, as well as a sharp, dry, peppery oak from the whiskey barrels it was aged in. The drink I am going to share with you today features this distinctive brandy, and falls into a category that actually predates the cocktail: The Sling. 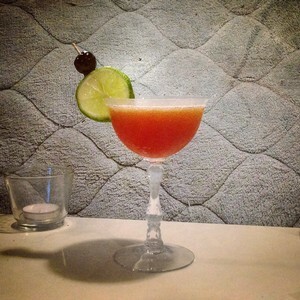 Many assume that a cocktail refers to any mixed drink, and in many places today the two are indeed synonymous. However, once upon a time, a cocktail had a very specific definition, and was just one more in a long line of mixed drink categories. The original definition of a cocktail is a mix of spirituous liqueur with water, sugar, and bitters. Stirred or shaken with ice and strained into a cocktail glass, with a fresh fruit garnish. Other mixed drink categories at the time included The Smash, The Punch, The Julep, The Sling, The Sour, The Fizz, The Flip, The Crusta and many more. Eventually all these families of drinks would fall under the blanket term "cocktail." -Julep: Alcohol, sugar, water, and sometimes fresh fruit/herbs served in a julep cup with crushed or shaved ice. -Smash: Like a Julep, but not particularly in a julep cup, and with only shaved ice. -Punch: Alcohol, fresh fruit juice, and other mixers, normally served in a large bowl for entertaining. -Sour: Liquor, lemon or lime juice, and a sweetener, sometimes with an egg white. -Fizz: Alcohol, sugar, and soda water. The soda water makes it a fizz. -Flip: Has an egg in it. -Crusta: Has a sugar rim. What is a Sling then? A Sling is simply a mix of liquor, water, and sugar, served hot or cold, strained into a glass. Truly the most basic of mixed drinks. I have found very few true Slings that I like. Usually combining sugar and alcohol without bitters produces a drink that cloys at the throat, like cough syrup. The bitters are an integral part to the balance of the cocktail. There are, of course, exceptions. The syrup I use in this drink makes all the difference. It has a real tart note that offsets the sweetness and provides balance without the use of bitters. The brand I used was D'Arbo, an Austrian company famous for their preserves. Their sour cherry syrup is the best I've found. Our sister store, Napastak, carries it here in the Oxbow Marketplace. If you can't find that, a 50/50 mix of Tait Farms Sour Cherry Shrub and Luxardo Maraschino Syrup makes a good substitute. Shake hard in a cocktail shaker with ice until shaker is frosty. Strain into a small cocktail glass. Garnish with a fresh cherry. Give to your Mother this Sunday. She deserves it. Makes one 3oz cocktail.